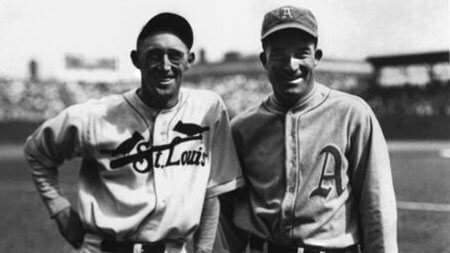 In the 1930 World Series, the Philadelphia Athletics defeated the St. Louis Cardinals in six games, 4–2. Philly’s pitching ace Lefty Grove, and George Earnshaw, No. 2 man in Mr. Mack’s rotation, won two games apiece. Earnshaw also pitched seven scoreless innings as Game 5 starter, but ended up with a no-decision as Grove relieved him in the eighth and took the win on Jimmie Foxx’s two-run homer in the top of the ninth for the game’s only scoring.